You've probably heard it said among our gank fleet members that the scouts are the most important members of the fleet, aside from the fleet commander (and even then it's arguable). All true. Our scouts play several roles at the same time. They're more like spies, really: Stealthy, sometimes invisible, sometimes in disguise, gathering intelligence, and oh-so-innocent behind their positive sec status. Our scouts may not carry weapons, but they are deadly. Our enemies learn their names quickly, and they immediately tense upon seeing one enter local. But how does a New Order scout operate? This post will offer some basic lessons. First thing's first. A simple Ship Scanner I allows you to peer into the tank of any potential target. It has no skill prerequisites. If you fit a Passive Targeter I (requires Targeting I to be trained), your prey will not know he's being locked and scanned. 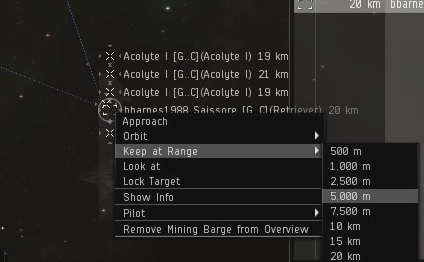 Simply activate the Passive Targeter and click on a mining ship. Though the glow of the module activation will not last long, you're in the clear. You can repeatedly scan the ship without its knowledge. And you must scan the miner repeatedly, because each time you do, you get only partial results. You used to get doubled results, but no more. 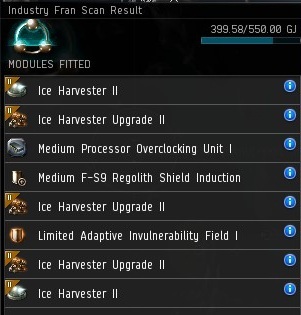 Simply note each tank module and run another scan to see if there are more. You should do at least 5 scans. Each one takes a second. Your fleet commander will determine if the target is too tanked. Tell him about shield and armor modules. You can ignore shield boosters and EM or Explosive hardeners, since they'll have no effect on what we do. To find targets, you can go to the nearest ice field, or use your directional scanner to find stuff in the asteroid belts. The simplest way is to scan a cluster of distant asteroid belts and then find out which one the target is in by warping to one and scanning the rest. Don't get too hung up on the targets; focus on the belts. Targets themselves may be stored in a POS where you can't get to them. ...and you'll automatically slow down quickly enough to not be decloaked, even by orbiting drones. At 5,000m, you're too far to provide a proper warp-in for the fleet. You'll want to be right next to the target just before the fleet initiates its final warp to you. It takes around 15 seconds to go from 5,000m to being directly atop the target. If the fleet HQ is in the same system, hit "Approach" when they undock. If they're in the next system, begin the approach at the FC's signal. If you're an FC, a good signal time is when you start dropping out of warp on the other side of the final gate. By the time you exit warp, jump through the gate, and get ready to do the fleet warp, the scout should be in position. A cloaked ship is not necessary for scouting. Sometimes it doesn't even help that much, because they often get decloaked in the busy ice field, or they drop cloak to run the Ship Scanner. Yet our scouts are notorious, and they get camped by people who want to interfere with the ganks. Scouts should always report to the FC whenever any combat ships are in the belt. A good scout is one who knows how to frustrate the campers. Here's how. First, a scout should hit different systems, rather than the same system over and over. A scout should check asteroid belts, as these generally aren't (or can't be) camped. Leaving campers in a belt all day while you strike elsewhere leaves them feeling useless. But if you want to hit a popular ice field despite the campers, there's a useful technique: Bookmarking targets. Any ship can fly right up to a target and create a bookmark. Enter the target's name as the bookmark and then leave. It's now possible for a fleet to warp to the target without having a scout in person to provide the warp-in. And without a scout, the campers have no one to camp. They'll have no idea where the next attack will come. 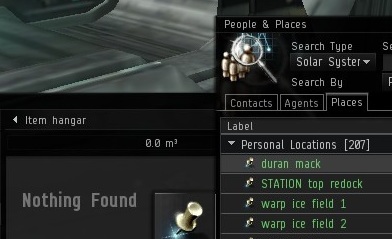 After collecting a target bookmark or two, the scout returns to the HQ station, copies the target bookmark into the inventory, and trades it to the FC. If the aggression period isn't up, the scout can continue looking for targets. Once the FC has the target bookmark in his or her own People & Places, the target(s) may be hit at any time. Using this method, a scout can even set up warp-ins in multiple systems at once, further frustrating campers who don't know which system is next in line for attack. This is also efficient because a scout can look for more targets, rather than sitting next to just one while waiting for it to be attacked. "But what if the bookmarked target leaves in the meantime?" you ask. After giving the FC the bookmarks, the scout returns (preferably cloaked, but not necessarily) to keep watch from a distance. If the miner has not left, the bookmark warp-in is still good. In a busy ice field, a scout can even sit next to a second target on the other end of the belt. If campers follow him, the scout tells the FC to hit the bookmarked target. If the campers don't follow him, the scout tells the FC to warp to him and hit the target he's sitting on. Either way, the campers lose and the gankers win. In some cases, I've seen miners return to the same position over and over throughout the day, because they've got their mining position bookmarked. But it's best not to wait too long before hitting a bookmarked target. Even though in theory you're "warping to zero", you can land 2,500m or more from the spot--especially if you bounce off an asteroid. A miner who returns to his old mining location may therefore be slightly further away, and leave some unlucky gankers just out of range. In any case, a ganker should always remember to get closer to the target on landing. Of course, if there are no campers about, it's easier for a scout to just sit near the target. But if campers are following a scout around, the ability to make undetectable warp-ins with bookmarks is a useful thing indeed. You can always go full ghillie suit & do it in a procurer. I do my scouting in a skiff. It's faster than a procurer, especially with an AB, and still tanky with the passive targeter and ship scanner. I put a salvager in the high slot but you can put in a strip miner for extra camo. Any mining barge or exhumer works. The idea of the ghillie suit is to mine while you scan. Skiffs & Procurers are a great choice because it costs more isk than miners are willing to spend to gank them. The speed of the ship doesn't matter when you can warp from point to point. Some more scout tips: The disgruntled miners suicide ganked several scouts. Have tank or a ship you can't care less to lose. Watch out for Ibises. They aren't lost noobs, they are dangerous ECM boats that can defeat a gank. Take your time to talk to the miners, educate them about the Code, taunt the campers. Loot the wrecks of the catalysts for profit. Salvage them and also the miners. Scouting is a profitable profession, perfect place for a newbie who can't afford catas. If you loot T1, yell at the noob who fitted them. Have Concord on your overview, they can't be in 150km of the target. Always talk to your fleet or they might get bored and go AFK. They don't see how busy you are, they just sit in the station doing nothing. 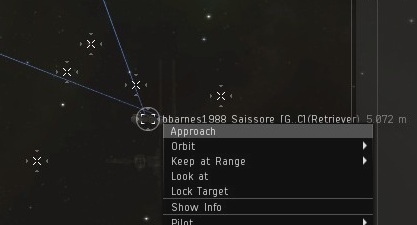 Link the name of the target to the fleet chat along with the system name. Scouting with a Venture in an ice belt is about as subtle as doing it with a Catalyst in any belt. You'll get the AFK miners because surprise surprise, they're AFK. You won't get the ones actually paying attention most of the time because why would a Venture be in an ice belt if not to scout? I much prefere the ghillie suit option. 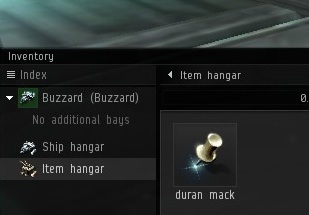 A procurer is easy to train into, and you can sell it when done with it, just don't rig it. As Mallak said, a Venture in an ice field is a red flag. Another option is to use an Orca to scout with ... and have both a passive targeter and the ship scanner, as well as the mining command modules. 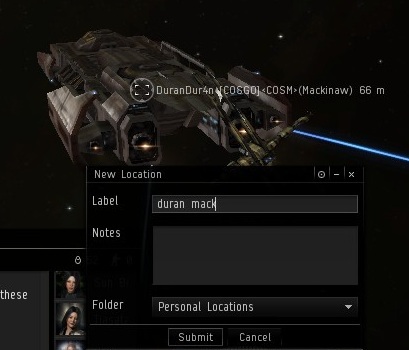 be careful as CCP does not approve of doing this. 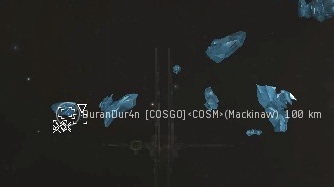 "be careful as CCP does not approve of doing this." "In a busy ice field, a scout can even sit next to a second target on the other end of the belt. If campers follow him, the scout tells the FC to hit the bookmarked target. If the campers don't follow him, the scout tells the FC to warp to him and hit the target he's sitting on. Either way, the campers lose and the gankers win." Played right, a scout that attracts attention can be just as useful as one that doesn't, we saw that firsthand on yesterdays ganks. A scout had a number of campers around him in one location while we warped to a bookmark that was being monitored by another, the tarps didn't know where we were going to hit and just wandered about in disarray. It was beautiful. 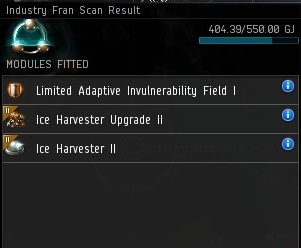 I've noticed a couple of miners fitting ship scanners, so in a busy ice field it's reasonable to expect that some of the regulars will know what your fit is. If your barge or exhumer fit looks suspicious then it's a pretty good bet that the locals know why you're there and are communicating that. Is there a reason you can't provide a warp in at a distance by aligning yourself at a set warp in distance behind the target along the line from which the gank fleet is coming from? Warp-in at distance works fine on stationary targets.